The stocks of both Canadian Western Bank (TSX:CWB) and Laurentian Bank of Canada (TSX:LB) have been battered! Year to date, they’re down in the double digits as shown in the chart below. CWB data by YCharts. Year to date price action of CWB and LB. Although the regional bank stocks are down by a similar percentage year to date, one is a better buy. After reviewing both stocks below, you’ll know which one is better. Canadian Western Bank has meaningful exposure to resource regions. So, its business performance has more or less followed the ups and downs of oil prices. For example, when the WTI oil price fell about 70% from over US$100 to about US$30 per barrel from 2014 to 2016, the market cap of Canadian Western Bank was cut in half from peak to trough. At the bottom, the stock traded as low as a price-to-earnings multiple (P/E) of about eight. Where does the stock stand now? At under $28 per share as of writing, the regional bank trades at a blended P/E of about 9.5. Since 2014, Canadian Western Bank has diversified away from resource regions. So, it might not head down to a P/E of as low as eight. As of the end of the third quarter, the bank had 37% of its loan portfolio in resource regions. Specifically, it had 34% of its loans in British Columbia; 32% in Alberta; 5% in Saskatchewan; 3% in Manitoba; and 26% in Ontario and other regions. Notably, investors should note that it had a negligible amount of loans ($0.1 billion) in the oil and gas production industry. Surprisingly, the bank’s recent net margin of 20.7% was in line with that of the Big Six banks. The Thomson Reuters analysts have a mean 12-month target of $38.50 per share on Canadian Western Bank, representing a 38% near-term upside potential. The bank offers a safe 3.7% dividend yield supported by a payout ratio of about 35%. It has increased its dividend for 26 consecutive years, and its quarterly dividend per share is 8.3% higher than it was a year ago. Laurentian Bank’s performance hasn’t been stellar. An eleven-year investment in Laurentian Bank (from before the market crash in the last financial crisis) would have delivered annualized total returns of about 3.5%. From fiscal 2010 to 2017, coming out of the financial crisis, Laurentian Bank only increased its earnings per share by about 4% per year. Moreover, the regional bank is estimated to have earnings decline this year and next year, which may be partly due to its buying back some mortgages that it sold to a third party earlier this year, which was a setback for the bank. The bank’s recent net margin of 12.9% was much lower than that of Canadian Western Bank. The Reuters analysts have a mean 12-month target of $47.10 per share on Laurentian Bank, which represents 12% near-term upside potential from $41.80 per share as of writing. The bank offers a safe 6.1% dividend yield supported by a payout ratio of about 46%. This year marks the 11th consecutive year of dividend growth for Laurentian Bank. Its quarterly dividend per share is 3.2% higher than it was a year ago. Although Laurentian Bank offers a bigger dividend yield, Canadian Western Bank is a better choice for higher total returns potential. Currently, Canadian Western Bank is hit by a low commodity price cycle. So, interested investors should look for a bottom in the regional bank stock and aim to book profits when we experience a high commodity price cycle. 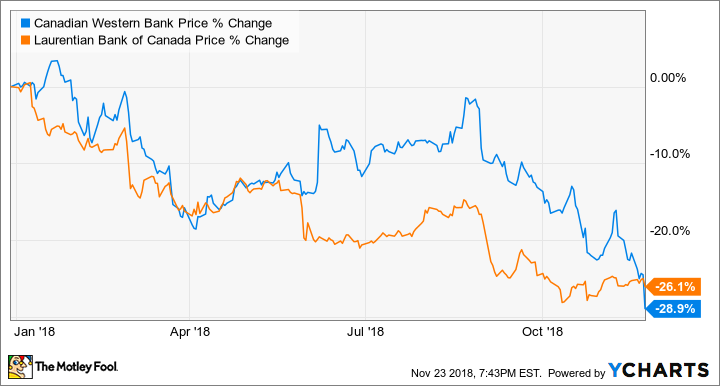 Canadian Western Bank should have some support at about a 4% yield, which implies a target buy price of $26 per share based on the current quarterly dividend per share of $0.26.